- it's easy to see that James Gunn wielded more power on the sequel, with expanded roles for bestie Michael Rooker and his brother Sean. Fortunately both these guys are terrific. - The second tier villains, the Sovereigns, were my favourite non-Michael part. The Sovereigns are haughty gold people who seem to have fallen out of a Ralph Lauren photoshoot. They are hilarious and Elizabeth Debicki as the lead Sovereign steals all her scenes. - Karen Gillan gets more screen time and some character development as Nebula. She is fantastic. Quill: "You sound like an old woman!" Michael is in three brief scenes. His character is "Martinex" and he's a lieutenant to Stallone's Stavkar. The pic below is an approximation of how he looks - onscreen his crystals are brighter (and seemed pinker.) One of his scenes is a teaser during the end credits which seems to hint that his character could return for GOTG3. And since GOTG2 is currently raking it in worldwide at the box office, for the third installment, Gunn should wield even more friends-casting power! BLESS YOU!!! I've been looking all over to find the "BIG SECRET" Of Michael's character. This is very cool. Can you really tell it's him or does the crystals really mask it? 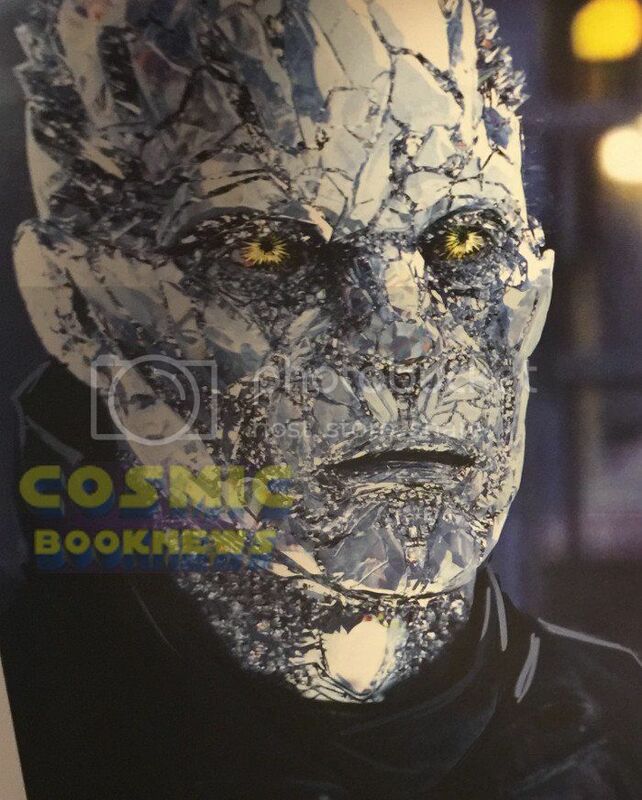 Can you really tell it's him or does the crystals really mask it? His epidermis is composed of a silicon-isotope organic crystal. Martinex has the ability to convert bodily energy into laser-like beams of energy which he can project from his hands. His right hand can project infrared energy, stimulating heat in any object. His left hand can project microwave energy that reduces thermal energies in objects, thereby producing coldness. GotG was great. GotG2 was 100% better. One of the few times the sequel movie was better than the first. I was in serious tears from laughing at the Baby Groot dancing scene right off the start, then when he was looking for Yondu's prototype. I could watch a full movie nothing but Baby Groot! So freaking adorable! I liked how the Guardians were collectively parenting him, with varying degrees of responsibility. What a scene stealer! I saw it last week and totally didn't recognise him. Had to IMDB the part later! Finally got round to seeing it today - not really my thing but I preferred it to the first one, although the first two thirds dragged a bit for me. It perked up from Hasselhoff onwards, strangely! Nice to see Michael - I did check who he was going to be first because I feared I might miss him otherwise (knowing nothing of the GotG-verse) but I think I would have spotted his body language if I had not known. Looks like there is scope for a return in the next one! Looks like there is scope for a return in the next one! Based on the teasers at the end (and Yondu's crew breaking up) there's room for new players on the board, everyone chasing after the last of the infinity stones. Glad the gold people are likely to be back too! I think I would have spotted his body language if I had not known. His head also still looks like his head, even covered with crystals. Exciting that Michael's is the first onscreen version of this character! It perked up from Hasselhoff onwards, strangely! The crowd in my theatre was young and clearly didn't know who DH was - I enjoyed that bit but there was puzzled silence all around me! I wondered how much young people would enjoy it since most of the pop culture references would go over their heads. I found that most of them were a bit before my time (which is perhaps another reason that both films don't really do much for me) - I was only familiar with a couple of the songs in each film, and Cheers and Knightrider are things I was aware of but never watched. Hasselhoff was ubiquitous though! It's good that Michael is still recognisable under the crystals once you know who he is - much better than being just CGI! I found that most of them were a bit before my time (which is perhaps another reason that both films don't really do much for me) - I was only familiar with a couple of the songs in each film, and Cheers and Knightrider are things I was aware of but never watched. It might also be that the frame of reference is very US-centric. I've noticed the reverse sometimes, when I should be of the right age to catch the references in a UK show/movie, but don't because it's UK-centric.